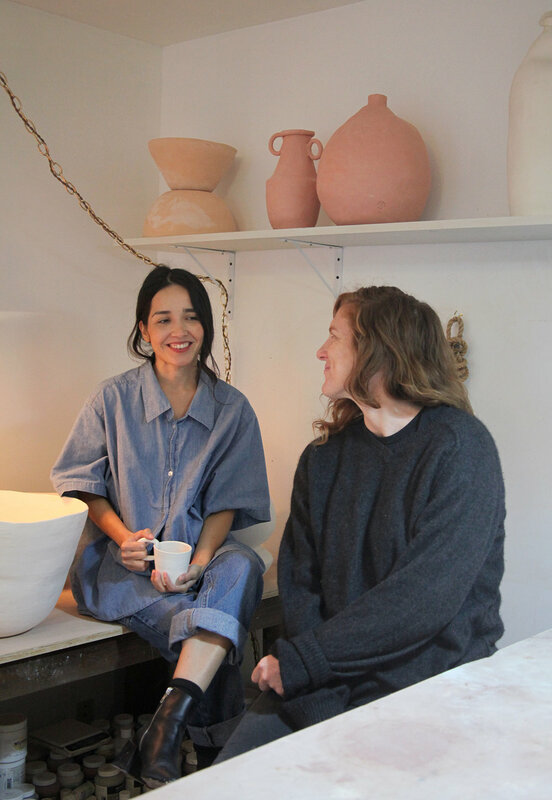 On a rainy Friday afternoon we visited the ceramics studio of Amanda Rivera + Diana Welch, the creative team behind Mother of God Ceramics, and returning vendors to the fall FELIZ sale. 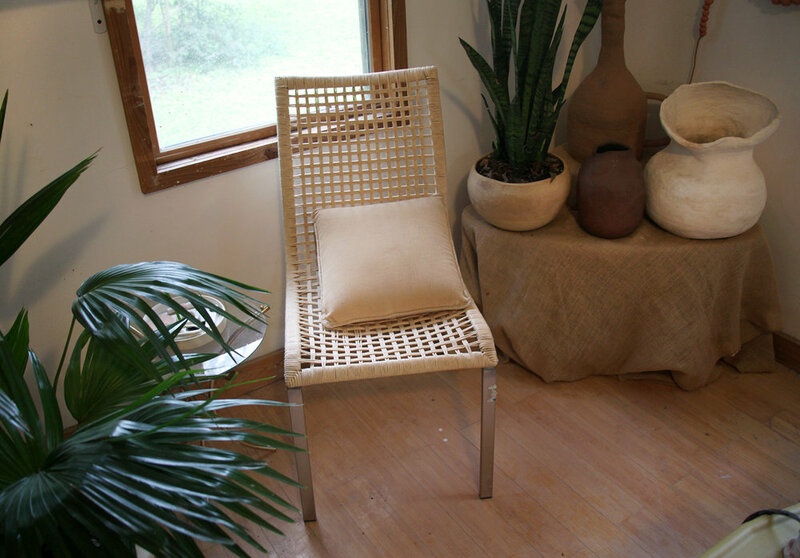 Their space is nestled inside an artist compound in east Austin. 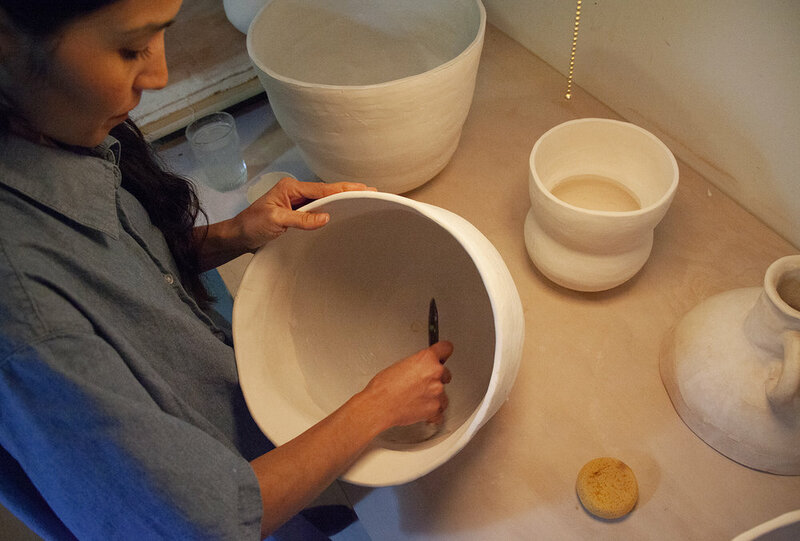 From here they collaborate on one-of-a-kind pieces for commercial and personal use, with a focus on creating objects that allow for self-guided rituals. From custom light fixtures (seen at Better Half Bar) to hand sculpted incense burners + pipes, each MoG piece embodies a tenderness of hand and reverence for the material. Continue on for a glimpse into their studio and practice. Can you share a bit about your origin story. What brought you two together as makers? The idea to work together came from being studio mates, actually. We have such a similar aesthetic and approach, it just felt right for Amanda to join MoG as Diana's partner. How do your own unique perspectives co-inform Mother of God's aesthetic? We both love the imperfect and unexpected. We love to challenge ourselves to create new shapes, and we both have a really relaxed approach to our practice. If we were forced to find a difference in our approaches, you could say that Amanda brings a more feminine eye, while Diana's might be considered more masculine. It's hard to explain, but that duality is kind of there. Describe a typical [and by 'typical' we obviously mean non-typical] day in the studio? We try to be in the studio together once a week, but our schedules can make that hard. We both have our own little rituals that we use to create that mental shift when we walk into the studio. But lighting incense or a candle and taking a puff seems to be a shared routine. Is there anything in particular you like to listen to/watch while you work? When we work together, we often find ourselves working in silence, which feels really special in a way. But, solo, Amanda is more of a podcast listener while she works, and Diana tends to listen to music more than talking - Alice Coltrane, Ethiopian jazz, or a Spotify radio based on whatever song is in her head. What draws you to clay as medium? What does the material – and process of working with the material – offer you space to say, to capture, to comment on? 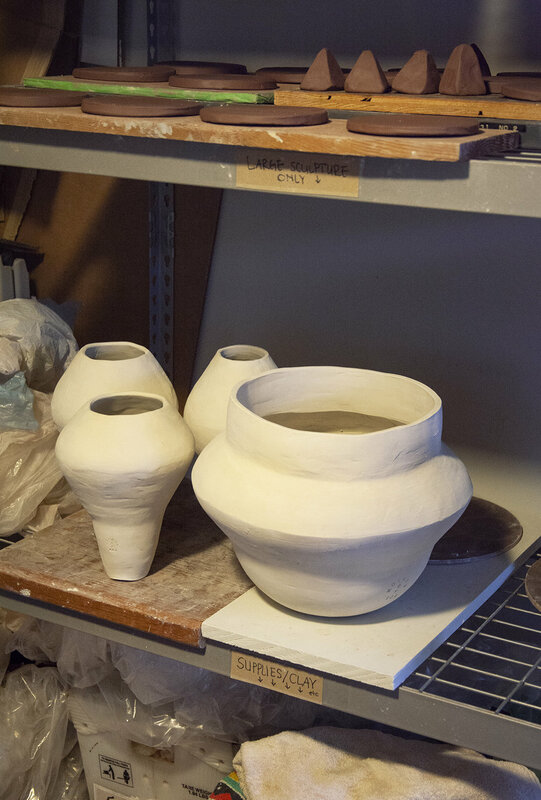 We love the unexpected nature of clay, the flexibility of form, and the lack of ego the practice requires. 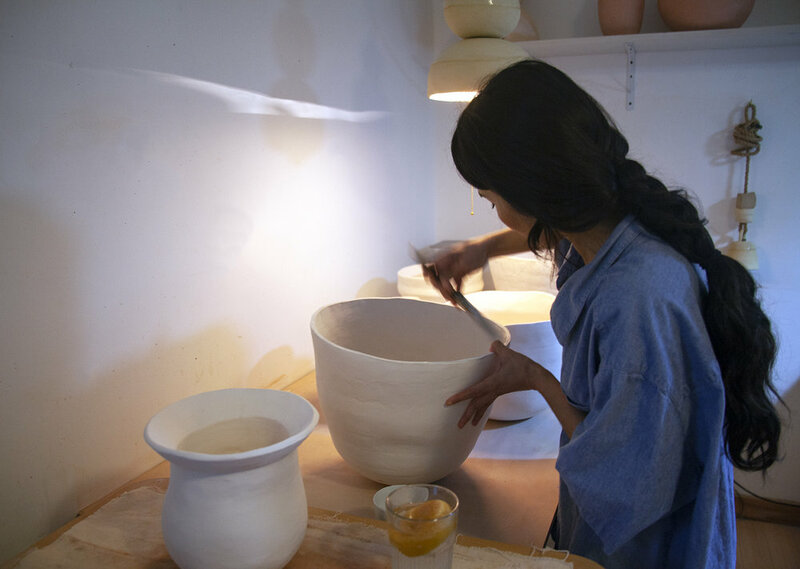 Working with clay is a meditative practice in and of itself - you just have to let go of expectation so much of the time. It really is so much about the process for us. As makers, we’re constantly balancing disparate priorities. What system, routine, non-routine, practice, and/or discipline best helps you center? We both have too many ideas! We can't keep up with ourselves, literally. Both of us just want to be in the studio all the time, but both of us have other jobs and responsibilities that prevent us from being able to do that. We are constantly having to re-prioritize, and we put a high emphasis on communicating our feelings with each other so that we don't get confused or resentful as we go. How do you manage and work with creative ennui? We try to be kind to ourselves and each other. We remind each other and ourselves that Mother of God is an art practice more than it is a business. While we really do want to build something sustainable, we are allowing ourselves the space to do so in an organic, relaxed way. Are there any books, podcasts, TEDtalks, or personal heroes, that help guide you through a creative lull? Going to Brancusi's studio while we were in Paris was pretty magical. And we are always sending each other pictures on IG of work that inspires us. There are so many amazing designers out there, and we are always looking for positive examples of how we can grow and expand as a studio practice. We are in talks to have another show in Spring 2019 and we are excited to see what comes of that. Otherwise, we are really focusing on our vessel families and our hand-built planters in the coming year. We're also looking into some art residencies to give ourselves time, space, and inspiration. We're just so happy to be making the work that we are making, and grateful that we get to do it together. Stop by Mother of God’s booth on Saturday, December 9th at The Palm Door on Sabine.